The Sioux City Public Museum: The Sioux City Public Museum has a wide variety of exhibits, but arguably the most fun for kids is the giant sandbox where they can dig for fossils! The Dorothy Pecaut Nature Center: The Dorothy Pecaut Nature Center has interactive fun and live animals on display year round. The Long Lines Family Rec Center: The Long Lines Family Rec Center adjacent to the Tyson Events Center is probably best known for its climbing wall, and with good cause--it's arguably the best rock climbing wall between Chicago and Denver! But Long Lines also rents out basketball courts, volleyball courts and batting cages, plus hosts Open Gym for Tiny Tots every weekday morning (M-F 8am-noon) free for kids under 7! Check out their website for more info on hours, options, and admission and membership rates. Drop Zone Family Fun Center: Drop Zone Family Fun Center features a trampoline ninja course, laser tag, and more! Prices vary, but a popular option is the $20 deal which includes an hour of jump time, a game of laser tag, and a $5 game card. LaunchPad Children's Museum: LaunchPad Children's Museum is home to dozens of fun exhibits and acticivities that foster learning, creativity, and fun. They also have lots of special programming for kids and families. The Norm Waitt Sr. YMCA: The Norm Waitt Sr. YMCA in South Sioux City provides Siouxland families with facilities and opportunities for indoor swimming, yoga, basketball and more. Plaza Bowl and Rush Werks: Plaza Bowl on Sioux City's northside and Rush Werks in Morningside both have lots of open bowling times. I recommend checking the Plaza Bowl and Rush Werks Facebook pages for the most up to date info on hours and fun events. 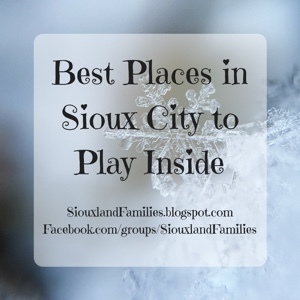 What's your favorite indoor attraction in Sioux City to visit on a cold day? Let me know in a comment on the blog or in the Facebook group!